Welcome to GAZZARRI DANCERS.COM, the premier and most accurate website about the GAZZARRI DANCERS and HOLLYWOOD A GO-GO. Others have tried to copy us; some have gone so far as to plagiarize us, but we remain the fan favorite go-go site with new information, exclusive photos, and videos being added on a regular basis. 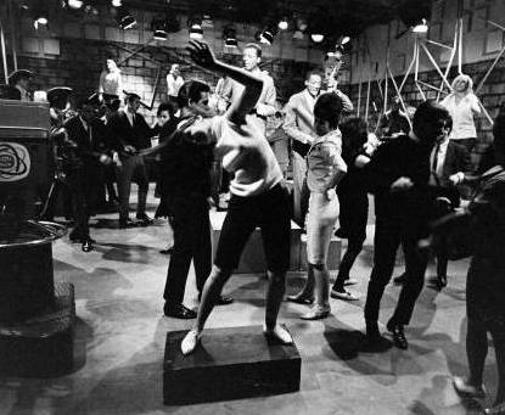 This site is dedicated solely to the elite group of GAZZARRI DANCERS who appeared on the 59 episodes of the late 1964 - early 1966 HOLLYWOOD A GO-GO TV show. It has been created for several reasons, the foremost being to give this group of ladies some very long overdue recognition and thanks for entertaining us. The other main reason is to satisfy the nostalgic curiosity of a large number of baby-boomers who have wondered what ever happened to the dancers over the more than four decades since the end of the show. When this idea first came to me in mid-2008 I was quite surprised that the topic had not been tackled before. The large number of positive YouTube comments about the GAZZARRI DANCERS made it even more surprising. Thinking that a quick internet search would satisfy my own curiosity I found that I could not have been more wrong. I hit a brick wall and a veil of silence, not only about the dancers, but also the TV show. The answers were just not there because it was a locally, and not network, produced show. I took on a partner to help in the research about six months into the project and slowly we started to make progress. The big break came when I finally contacted a former dancer. Because there are still many unanswered questions and missing dancers the research will continue. We are hoping that some readers can help and encourage you to contact us if you can add to or correct anything we have posted. 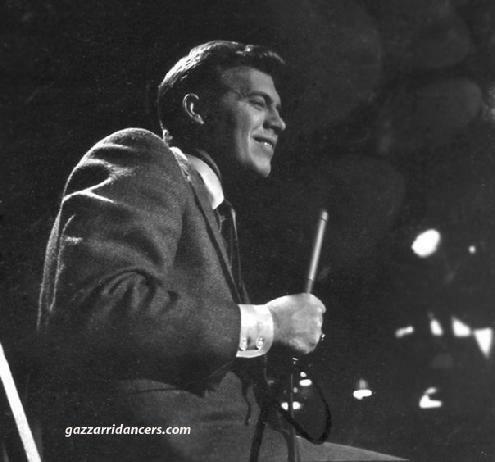 Starting up in December 1964 and running through February 1966 the show featured an eclectic mix of rock, r & b, and popular music artists, some of whom such as Aretha Franklin, James Brown, Tina Turner, and Simon & Garfunkel later went on to become major stars. In retrospect however, the show's biggest catch might have been the Rolling Stones who played 3 songs on a May 1965 appearance. There were two constant presences throughout the run of the series, namely SAM RIDDLE who was the host, and the GAZZARRI DANCERS. 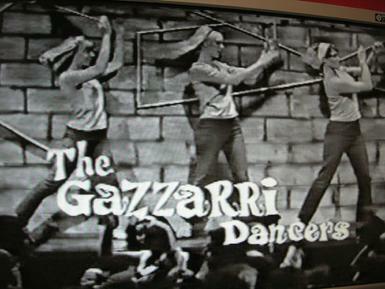 The GAZZARRI DANCERS carved out a reputation for themselves of being not only the prettiest go-go dancers from amongst the many other competing music shows, but also the hippest. These were no generic cheerleader type dancers, but cutting edge for their time beauties, dancing to the best choreographed routines from the mid-60's. The dancers on the television show are not to be confused with the go-go dancers in Gazzarri's nightclub from the 1970s and onwards. 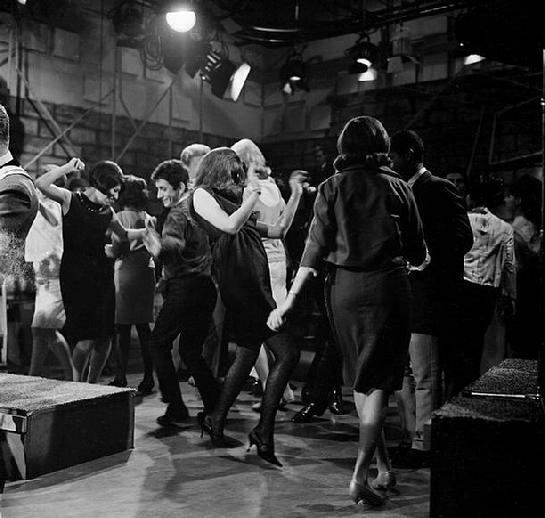 During the earlier episodes there was some interplay with girls who danced both at the club and on the television show. We are still researching this topic. The club had dancers right into the 1990's when it closed down. 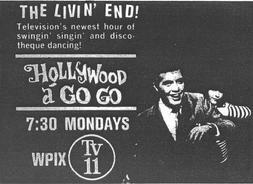 The dancers on HOLLYWOOD A GO-GO were there for only a little more than a year. There are some performances that are quite memorable. One that constantly draws positive comments is the sixguns, holsters, and cowboy hats routine on the wonderfully choreographed Bobby Fuller 4 "I Fought The Law" performance. This is classic go-go dancing at its best. Another is the hand-jiving during the Bo Diddley "Let Me Pass" performance. Check out this video to see just how good these girls were with their timing and coordination. On this site we would like to introduce you to as many of the dancers that we can currently identify and update you on what has become of them. You can also take in a more detailed history of the show which also includes more information on the dancers and their job. And we have identified the guest musical acts on as many episodes as possible at this time. There are also links to over four hundred HOLLYWOOD A GO-GO videos on YouTube and facebook, all of which feature the fantastic and talented GAZZARRI DANCERS. We have the largest collection of videos from the show and are constantly adding more. We have also included a brief history of The SINNERS, who have come to be known as the HOLLYWOOD A GO-GO "house band" due to their numerous appearances on the show and their association with Gazzarri's nightclub. There is also a feedback page where you can leave your comments about this website. Hopefully some of you will be able to help us locate additional dancers or provide additional information about any topic on this site. And lastly there is an acknowledgement page for us to thank the generous people who have allowed us to use their photographs on this website. 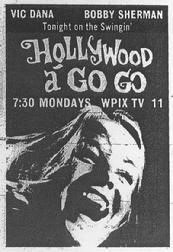 All of the photographs of the musical guests on this page were taken either on the HOLLYWOOD A GO-GO set or in the KHJ studio. The photo below shows GAZZARRI DANCERS DALE VANN (front), MIMI MACHU (middle left), JACQUI LANDRUM (rear left), and DeANN MOLLNER (rear right). In the above photo (left to right) we have: MARIA POGEE, DAWN MICHAELS, DeANN MOLLNER, and JACQUI LANDRUM. The sweaters, pants, and wide belts are the same clothes that the ladies wore on some of the episode # 44 performances. This leads us to believe that the photo dates from the October 16, 1965 taping of this episode. 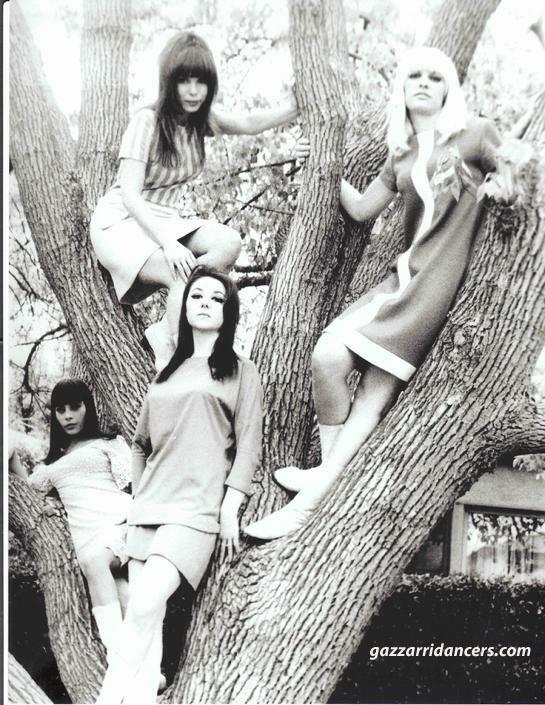 Below we see DAWN and MARIA in the lower branches, while JACQUI and DeANN have taken a higher perch. The location is on West Norton Street, between Santa Monica Blvd. and Sunset Blvd., in L.A. We have not been able to date this photograph yet, but it appears to have been taken on the same October day. Obviously there was a change of clothes involved if this was the case. 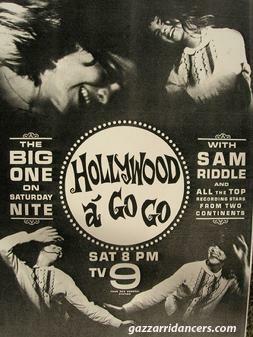 HOLLYWOOD A GO-GO host SAM RIDDLE also hosted a daily music dance show on KHJ-TV called 9TH STREET WEST. At the same time he was also a radio DJ. He juggled all three of these jobs at the same time, making him one of the most recognizable radio/television personalities in southern California. This wild scene below shows JUNE WILSON dancing front and center with The Pair Extraordinaire playing. She was new to the show with this being just her second episode. You can also see DeANN dancing to the right. 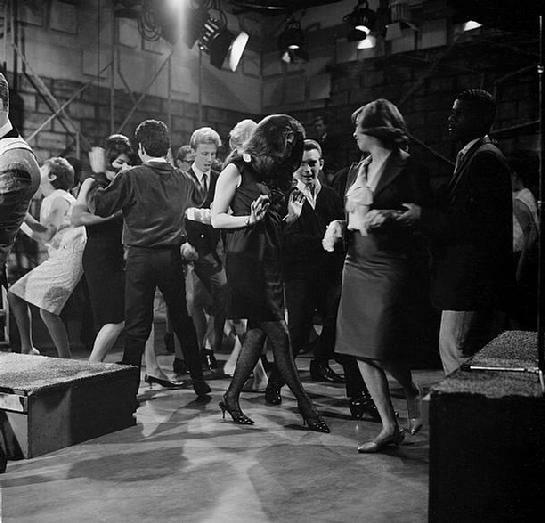 The photo was taken during the taping of episode # 19 on April 24, 1965. Another photo showing JUNE in silhouette, resting for a moment, during the episode # 19 taping. 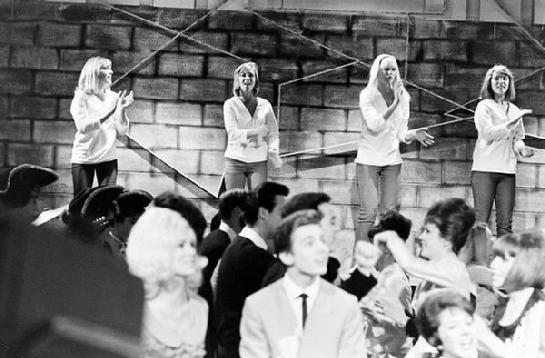 In the background we can see SAM RIDDLE flanked by Jackie DeShannon and Timi Yuro. 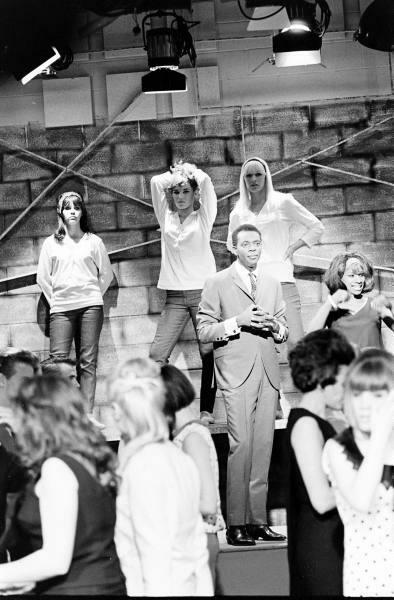 In the far background on the main dancing platform are (left to right) LUCILLE, ROBERTA, DeANN, DALE, and MIMI. The group in the background is Paul Revere & the Raiders, who were making their only appearance on the show. This interesting photo, also from episode # 19, was taken during a break in the video taping. On the main dancing platform we can see MIMI, DALE, and DeANN. In front of them is Marcus Hemphill from the Pair Extraordinaire and Brenda Holloway. Another episode # 19 photo showing (left to right) ROBERTA, DeANN, DALE, and MIMI on the main dancing platform. In the foreground you can see Bobby Sherman, Timi Yuro, and SAM RIDDLE. 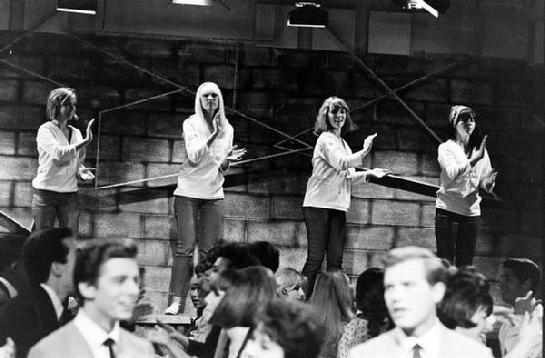 This shot from episode # 19 shows (left to right) LUCILLE, ROBERTA, DeANN, and DALE on the main dancing platform during the show's closing. In the foreground are guests Jackie DeShannon, Bobby Sherman, and Timi Yuro. 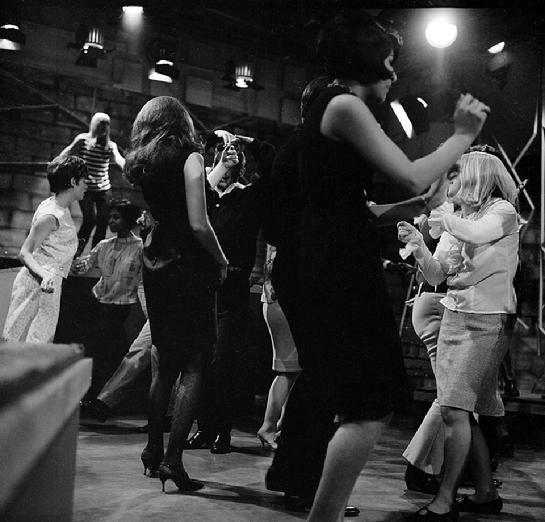 Below are three great action shots taken on the dance floor during episode # 7 which was taped on January 30, 1965. In the background in the third photo you can see DeANN on the main platform. ATTENTION: There are 37 pages on this website. Viewers with small monitors or netbooks who do not see the menu will need to scroll to the far right to access it or change their text settings to see the entire pages. All text on this website, unless otherwise credited, by Jim Freyler© 2009 - 2019. All stage set diagrams by Michael Riedel © 2013-2019. All rights reserved. No reproduction of these pages in part or whole may occur without the written permission of Jim Freyler.